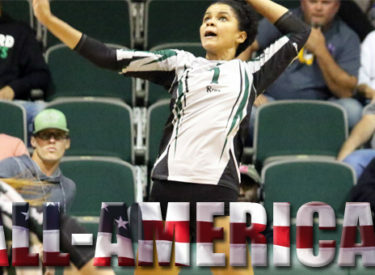 Seward County’s Maritza Mesa put an exclamation mark on her outstanding Lady Saints career on Wednesday as she was announced as an Honorable Mention NJCAA All-American. A teary eyed Mesa’s reaction when Lady Saints Head Coach Thais Baziquetto-Allen broke the news to her, “don’t play with me like that coach” the sophomore said before breaking down with cries of happiness. She becomes the first Seward player to receive All-American honors since 2008. Mesa had a huge second year for the Lady Saints in 2016, ranking second in the Jayhawk Conference in kills per set on the season with 3.42, the most by a Seward hitter since 2011. Mesa wasn’t just an offensive force for the Lady Saints though, also finishing second on the team with 2.64 digs per set on the season while chipping in 0.55 blocks per set as well. She finished with 14 double-doubles on the season including an 18 kill, 11 dig performance in the Lady Saints Region VI Championship win. The big stage of the NJCAA National Tournament didn’t affect the lefties production either as she notched 12 or more kills in all three of the Lady Saints matches at nationals while putting together double-doubles against Polk State and Tyler. Mesa was one of just two right side hitters to receive the honor of being named an All-American and was also one of two Jayhawk Conference players named to the team to go along with Colby’s Aleksandra Malek who was a second team selection. She becomes just the 12th NJCAA All-American in Seward County program history, joining an esteemed list of the top Lady Saints to ever play in the Greenhouse. Her selection as an All-American snaps a seven year drought without the award for a Lady Saint as Jelena Simic was the last Seward player to pick up the honors during the 2008 campaign.